Matt Green, a civil engineer, is dedicating his life to walking every single street in the 5 boroughs of New York City. It will be 8,000 miles all told. He’s been at it for over 1200 days, walking around 10 miles a day. He keeps track of barber shops that use K for “Kuts”. For real. No mention fried chicken or ramen shops. Strange, huh? Randy Olsen wrote an algorithm to figure out the most efficient walking route to see 27 of NYC’s most popular sites in one day. He’s created a 14 mile stroll that goes from the 9/11 Memorial (breathtakingly beautiful), to the Empire State Building (classic) all the way up to MoMa and the Natural Museum of History. But there’s no mention of bagels or doughnuts. 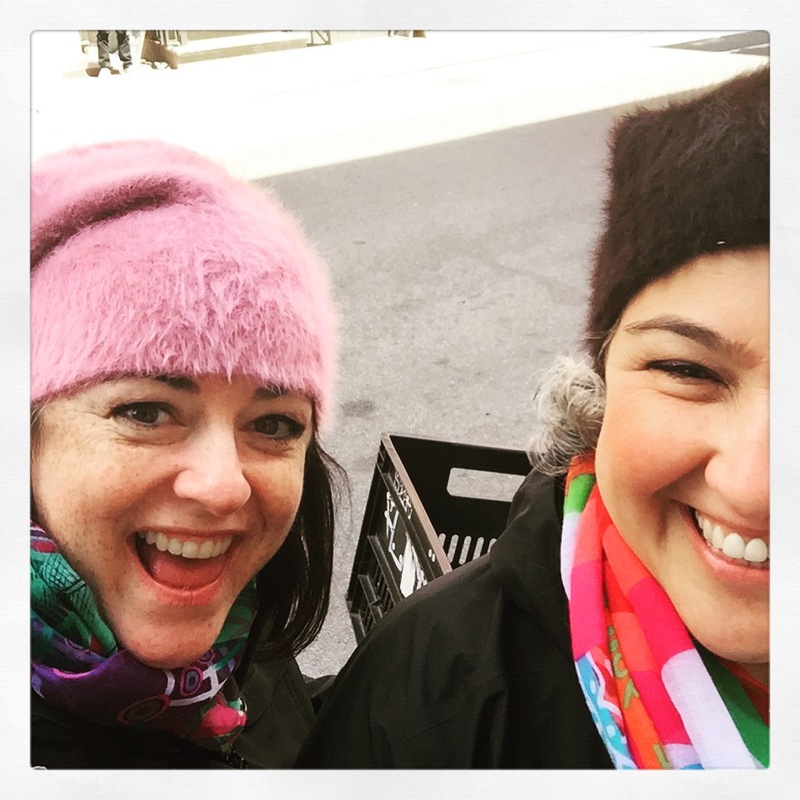 I, on the other hand, through rigorous research, tasting, some walking, and the support and encouragement of my fellow intrepid travellers, have created a 3 day itinerary that covers part of Manhattan in “bite size” pieces….one tasty neighborhood at a time. Start at the super cool Standard Hotel for drinks, and then walk over to Santina at 820 Washington Street for lunch. In case you’re wondering what all the bright colours and umbrellas are about, it’s an Amalfi Coast Beach Club vibe (duh) – delicious and fun. 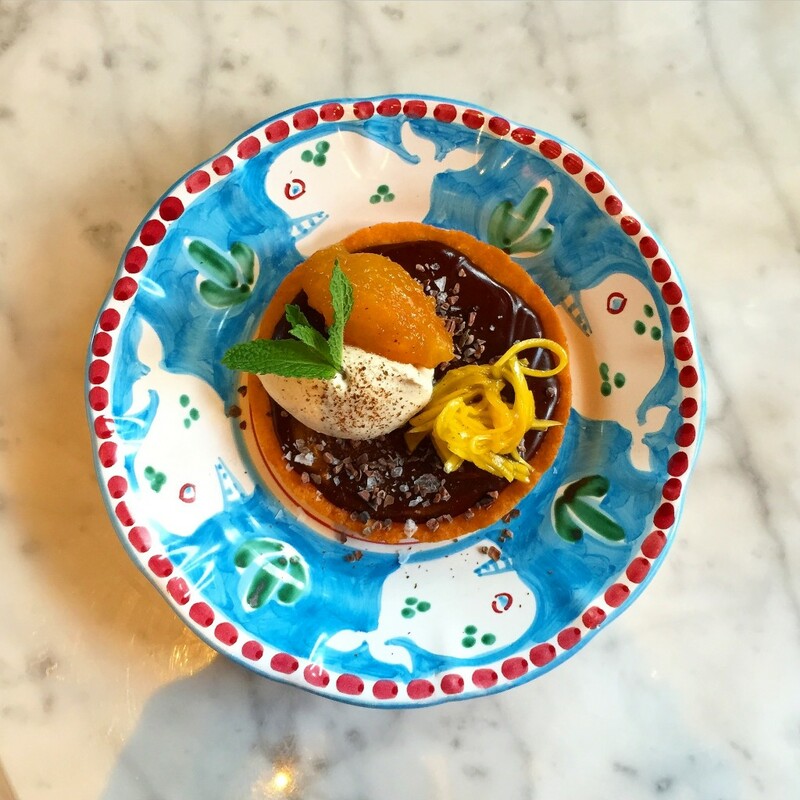 Start with any of the “cecina” (chick pea flour pancakes topped with stuff like lamb tartare or mushroom ragout), but save room for delicious desserts. If grazing is more your style, (or if you’ve still got a little room) walk over to the Gansevoort Market – where you can find bacon on a stick (it’s a thing), bruffins (croissant muffin hybrids…it’s trying to be a thing), tacos, and a myriad of other treats. Your tummy satisfied, you will be ready for a little stroll, and you’re at the perfect place to start a walk to Chelsea on The High Line. The High Line is an old service railroad that was used to get supplies to various parts of Manhattan. Obsolete for many years, some genius decided it would make an amazing park and walking trail…it’s got art installations, gardens and spots to sit and soak up all the New York-ness. In the dog days of summer you may bump in La Newyorkina selling her insanely delicious paletas. If you hop off the Highline at Chelsea Market, you’ll have walked at least an entire kilometer, so I am sure you’ll be famished. Good thing the market is chock a block with things like lobster rolls and fresh doughnuts. 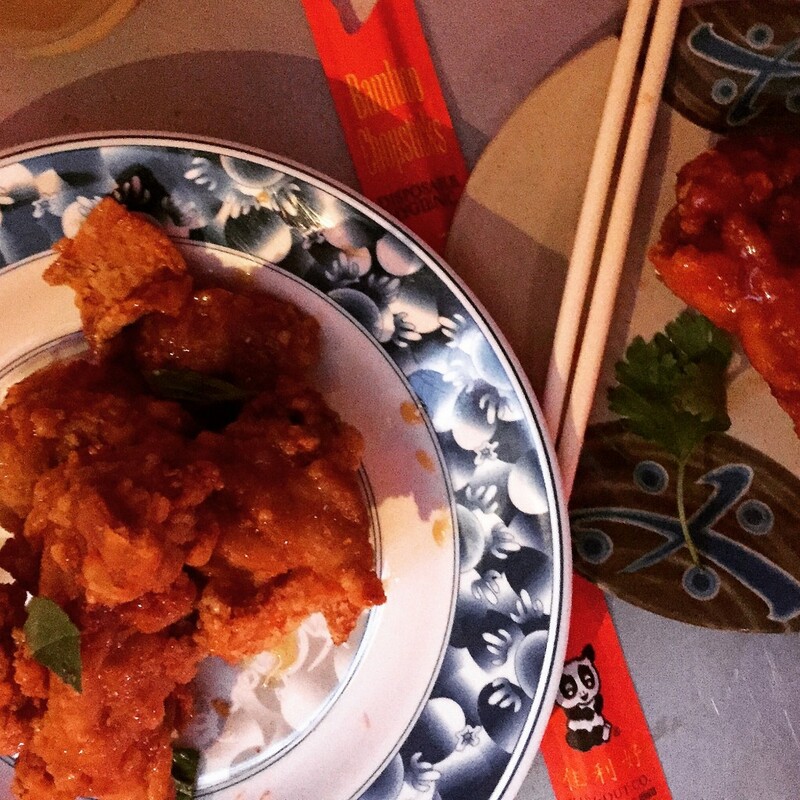 Day 2: Lower East Side used to be a “dodgy” spot and still is a bit – but feel the adventure and go for it – there is some serious amazing food down here. Start your day with a visit to newly opened Russ and Daughters Café. They have been serving Jewish “appetizing” delicacies for decades (take out only) on East Houston, but recently opened the cutest restaurant on Orchard Street – go for breakfast. Meander over to Clinton Street, where 3 amazing places are all clustered together. 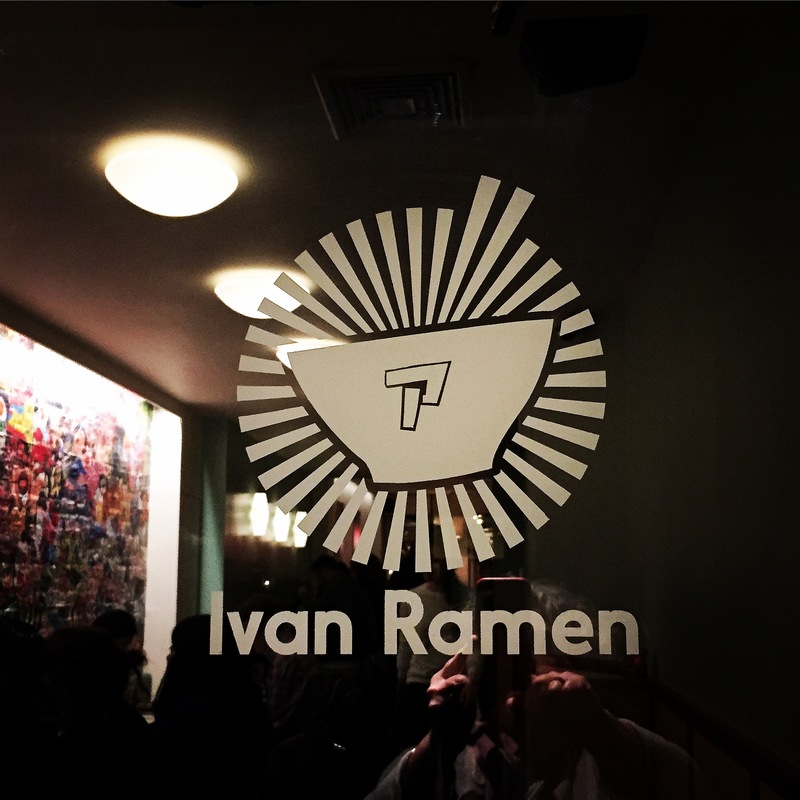 Ivan Ramen – New Yorker Ivan Orkin became famous in Tokyo for his ramen. He only opened his first US location in 2013. The noodles are made by Sun Noodle – considered to be North America’s god of Ramen Noodles. You’re (obvs) supposed to have ramen, but I gotta say – the Dan-Dan Noodles are life changing. Down the street is Seoul Chicken – this place looks like nothing – but it is serving the most amazing varieties of Korean Fried Chicken – twice fried then tossed in amazing sweet/spicy sauces. My fav is Honey Sriracha with a kick of lime. No reservations, lots of neighborhood types – cool cocktails, amazing friendly service. I can’t stop thinking about this place and how out of this world delicious it was. Across the street is phenomenal Thai/Philipino resto Pig and Khao. The smell at the door is intoxicating. Even if you’ve eaten at both Ivan Ramen and Seoul Chicken you’ll be tempted to add your name to the waitlist for a chance to taste some pork belly adobo. Now, get out your Googler and figure out where Morgenstern’s is, and waddle over there. Yes, it’s a bit far, but think of it as the “Highline of the Lower East Side”, except without the art and gardens but with an extra dose of gritty New York. Morgenstern’s is amazing. We went twice. But we were in the city for two days. So yeah….we went every day. But only once every day. 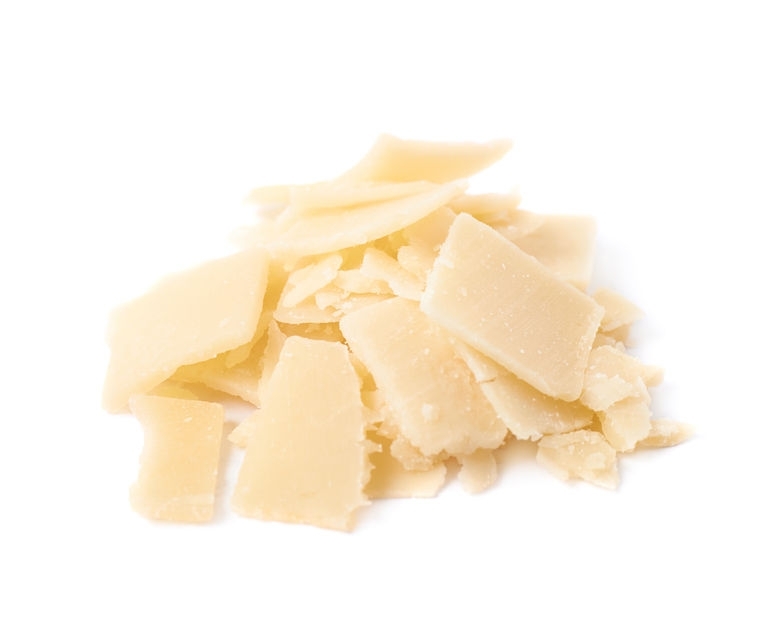 Their flavours are divided into “Vanillas” “Chocolates” etc…with so many awesome varieties. 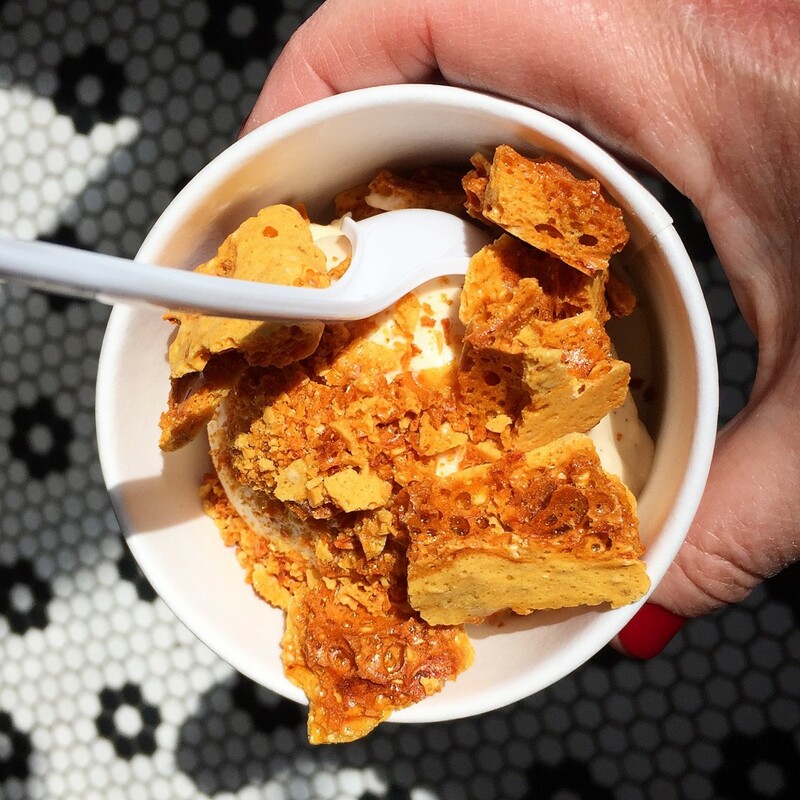 Toppings are superb – like toasted coconut, picosos peanuts…go for it… you just walked there for heaven’s sake. (You did walk, right…you didn’t chicken out and call a cab did you?) Burnt honey ice cream with sesame sponge toffee. That’s all I have to say about that. Day 3: SoHo is probably my favourite neighborhood, and not just because it’s home of the cronut. 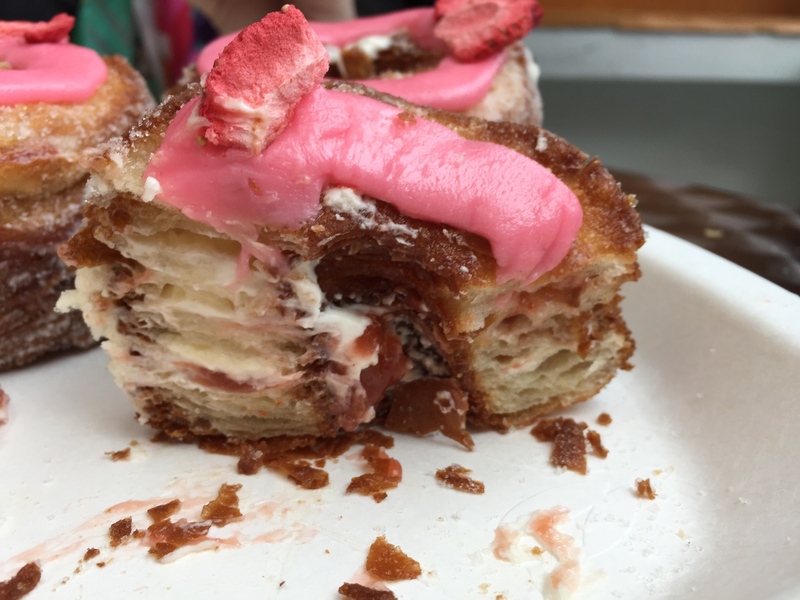 OK. Maybe the cronut has something to do with it. I have braved the line on two separate occasions now, and I can honestly say Dominique Ansel’s internet breaking sensation is delicious beyond belief. The guy is a genius with butter and flour. Think of the line up as just a very. Slow. Walk. A very slow walk where you are rewarded by DA angels with hot chocolate and warm madeleines. But still. 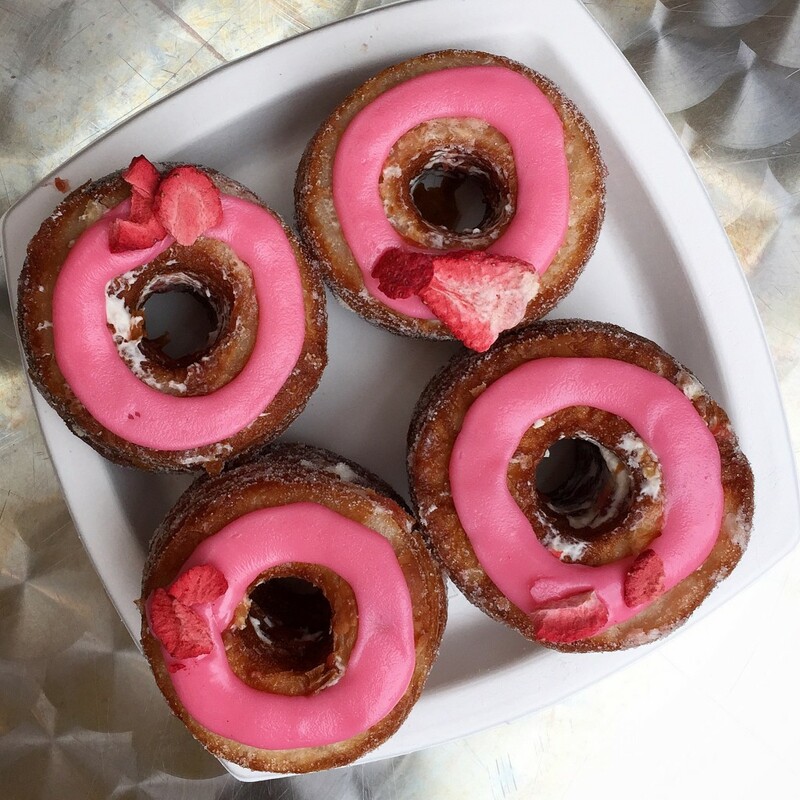 Even if you don’t want to line up for a cronut at the crack of dawn (who ARE you?) go later – every single thing is amazing….like his flourless chocolate cookies. Plus – he just opened a new shop. Check it out. Report back. Bring samples. 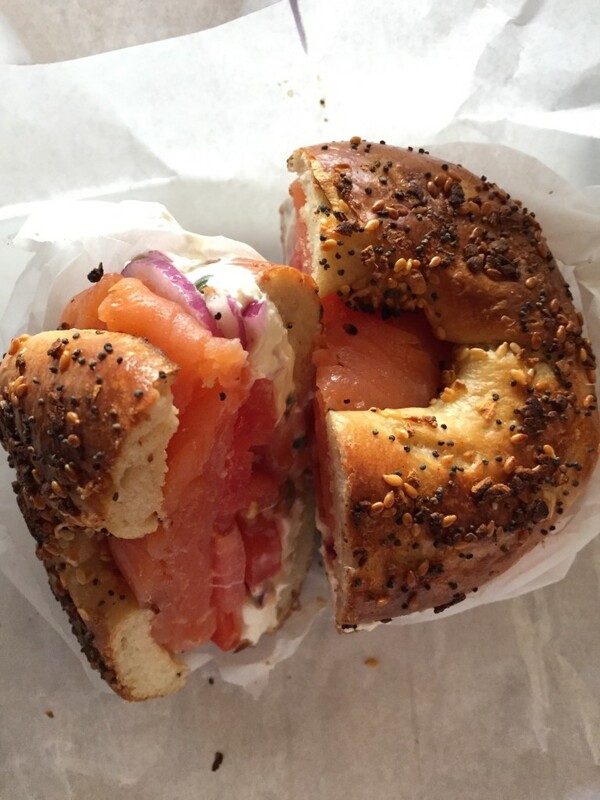 If you’ve had a cronut for breakfast, walk over to Black Seed Bagel for 11-sies. These aren’t Montreal bagels, but they are damn fine ones and their sammies with smoked fish and cream cheese are amazing. From here, you can walk and shop (nothing wrong with that – right?) over to lunch at Parm. Have one of everything. But two of the Buffalo cucumbers. You read that right. I love this place – it’s the size of a closet – so avoid noon for lunch if possible. To ensure your day is balanced with all the food groups, you’re going to need some ice cream. 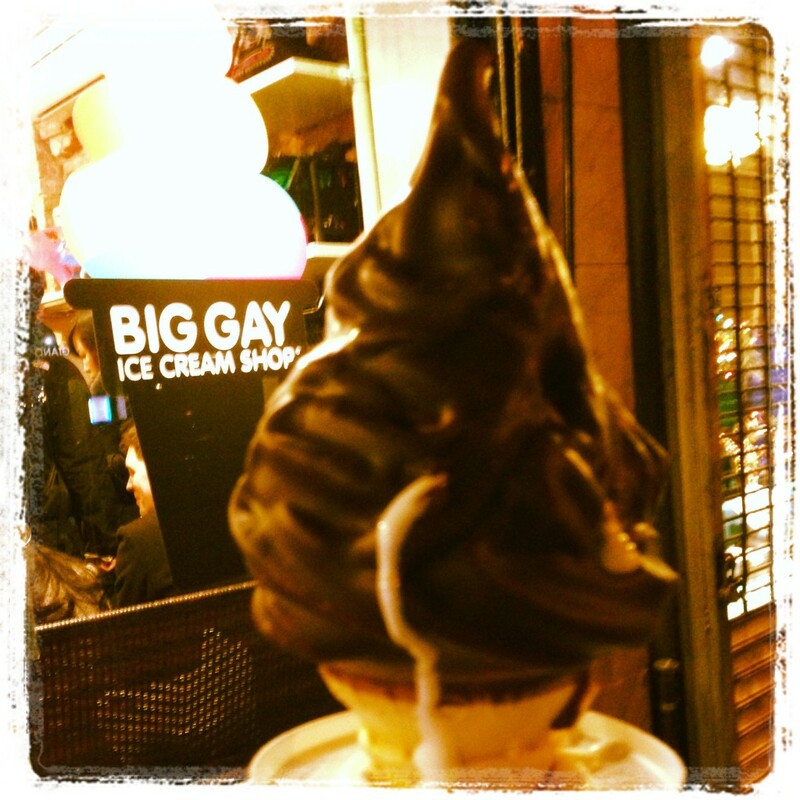 How convenient, you have your choice of two locations of Big Gay Ice Cream, depending on how much you feel like walking. Yup, a Salty Pimp is just what you need after your long, difficult day – you were up early after all. Then again, you could clock a few more walking miles and head back to Morgenstern’s, I think there’s time for you to stop there one more time. According to my finely tuned algorithm, if you follow this route, you will have walked a whopping 5 miles, made over 12 delicious pit-stops and consumed roughly 8,644,789 calories. I hope you packed a defibrillator, some band-aids (all that walking could give you blisters), and a warm hat in case it’s un-seasonably cold. I also strongly suggest walking home to wherever it is you live, even if it’s Toronto.